DFI uses the ever popular Award BIOS with their AD77 Infinity motherboard. Unlike previous DFI boards we have reviewed in the past, there are actually a lot of options/tweaks with the AD77! Ahh, after playing with mostly Pentium 4 motherboards for the last six months I really appreciate how many memory tweaks are available to AMD users. Above are the memory timings I used while testing. As you can see there are a fair number of AGP tweaks available as well. 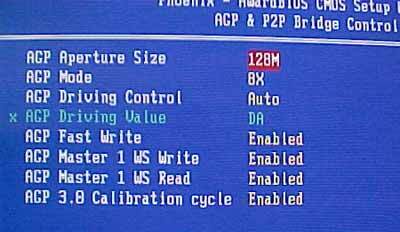 We were using the ATi Radeon 9700 Pro when we tested the motherboard and could not change the AGP mode from 8x. 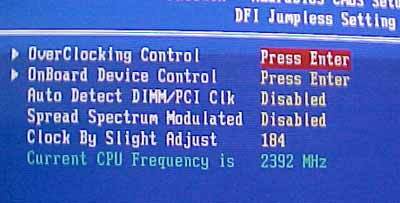 Here in the DFI jumper less setting as long as the FSB jumper is set properly we can adjust the FSB from 166 MHz to 250 MHz. Even though the FSB in the picture shows 184 MHz FSB, the system would not boot into windows at that speed with the latest bios. 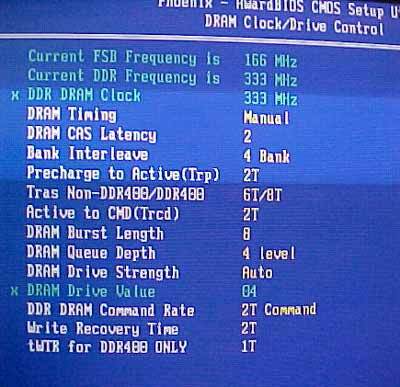 With the older original BIOS 190 MHz was doable. There are a lot of voltage control options. With the original BIOS we could go as high as 2.9V for the DIMM voltage, but after the flash the board maxed out at 2.63V. AGP voltage goes up to 1.9V and we can increase the KT400 chipset's voltage to 2.9V as well. In terms of CPU Voltage adjustments with a T-Bred processor we're allowed a maximum of 2V.